Lagosounds: Tales from the Sonic Trenches: EMMY Season: Celebrating "SEAL Team Six"
EMMY Season: Celebrating "SEAL Team Six"
On Thursday, July 18th, I awoke at 5:15AM to watch the live announcement of this year's Primetime EMMY nominations, as two projects I had participated in had been submitted for consideration. With a little Christmas morning-like anticipation (and a warm cup of coffee), I tuned in to the TV Academy's live feed to watch some of the preliminary action. As usual, there was talk of favorites, underdogs and surprises, but what intrigued me most were the impressive numbers that were being discussed. This year, approximately 4,500 projects were submitted for consideration in all categories. That's huge. Similarly, the Academy has about 17,000 voting members, all of whom help to choose which shows get nominated, and then again, which shows will win the coveted EMMY. This puts a lot into perspective, particularly when folks talk about popular actors or shows getting shunned. With such a large number of entries, and an enormous population of voters with their own tastes and likes, I find it difficult to believe that any type of blacklisting or shunning can occur. Sometimes it's in the cards, sometimes it ain't. There's always next year! Anyway, shortly after the talent and show nominations were announced, the TV Academy published their extensive list of nominees for the remaining categories. Happily, I discovered that the Monkeyland sound editing team and I had received a nominated in Outstanding Sound Editing fora Miniseries, Movie or Special category for our work on SEAL Team Six: The Raid on Osama Bin Laden. In the spirit of cliche´, I am truly honored just to have been nominated, and given the incredible stats and numbers I mentioned above, my sentiments are sincere and humble. 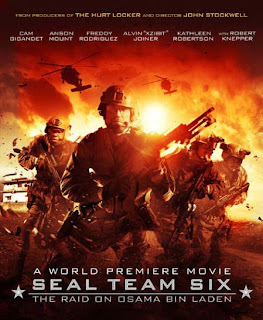 I must admit, SEAL Team Six has been good to us this year. Despite a meager post sound budget, a taxing conform job, two different final mixes, a tight delivery schedule, and very high expectations across the board, we succeeded in our sonic mission, which blessed us in turn with an MPSE Golden Reel Award earlier this year in the Television Long Form (Sound Effects and Foley) category. The second, equally amazing, round of accolades from the Television Academy last week really caught us off guard, but is certainly a welcomed treat. My gratitude is immeasurable. My thanks go out to all those who have made this nomination possible, of course, but I also must take time to reflect on the bitter reality that our success with SEAL Team Six is a result of the heartbreaking events that transpired in New York City in 2001. I find it bittersweet knowing that my success with this project will forever be linked to the tragedies of 911, but I find solace knowing that the our human spirit is strong and resilient. I know that we as a global society can learn from our experiences and hardships, make the effort to honor and respect one another, celebrate our differences, and take peaceful steps towards healing our spirits. So, I celebrated my happy moment that morning by texting my parents with an update and blasting the good news to my virtual family on Facebook. Soon after, I stirred my sleeping wife, who congratulated me with a very tired but smiley morning kiss. As I wait for EMMY night, I go on with life as I usually do: Calmly, patiently, with my eye on the big picture and focused on what's important to me and my family. Along the way, I continue to stir the pot a little, keeping life as interesting as I possibly can. I congratulate all those who were nominated, and I wish each of you a safe, successful and productive rest of the year. Many blessings.